2012 is off to a busy start for Salthouse Boatbuilders. Both sheds are full of noise and action as several new build projects get under way. As the books continue to fill up, Salthouses have another Southstar37 booked in for production later this year - this will be the 5th Southstar37 to come from the Salthouse yard - see the latest Club Marine Magazine for the Southstar37's most recent boat test. Last but certainly not least is the news of an exciting new project with designer Greg Elliott. Elliott Marine and Salthouse Boatbuilders have collaborated to produce a package deal for an exciting new 35ft carbon fibre, kanting keel race yacht. 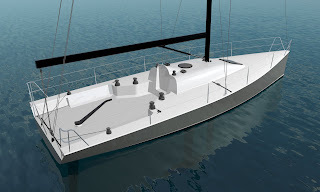 This new design (as pictured above) is going to offer an exhilarating yet uncomplicated solution to yachties wanting to get out and be competitive on the local & international circuit.